I’ve been experimenting for a few weeks with a tool with a great future in the market and would like to offer my review of Memsource as one of its users. I’ve been using it for some work related to the web, press releases, for jobs that came from other xlif-based tools and to translate our own website (English/Spanish posts) and in truth is an absolute delight. We reported on it in the latest entry of our blog and as David Canek, CEO of Memsource and a good acquaintance of mine, sees the future of translation tools. It has built-in a QA similar to XBench that compares all of the terminology (which is how their checklists operate). Let’s see some screenshots as references. Memsource is compatible with ttx and sdlxliff and formats based on xlif. This can come in handy to those translators who do not wish to pay astronomical figures for more expensive programs. It also has some connection to our PangeaMT automated translation engines. However, it may occur, that for very specific jobs we will be very tied to Studio or other formats and it would not be worth the effort for us to convert to another tool and export. I have tried exporting the Frequency Units and put them in again as TMX in Studio or another program to pre-translate the whole file. I’ve tried this with 100% success rates. In these cases, we can take advantage of the excellent connection that they have with the Microsoft Bing translator if the confidentiality agreement with the client allows us to. For any non-confidential type of work, it is a phenomenal tool because of the pre-translation that Microsoft Bing gives you, in my opinion is superior to Google and it speeds up your production time. In the upper tabs we see the typical import and export menus, the placement of tags in a style similar to the old Swordfish (by pressing F8). 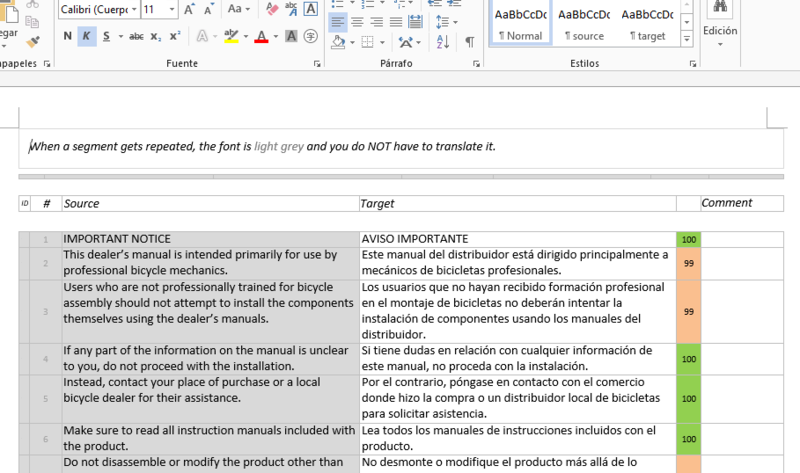 The menus allow exporting to bilingual docx files in which the repetitions appear in grey. This is very useful for translators who do not wish to use the online tool or editor and where the TM have a relative importance because the text is new. 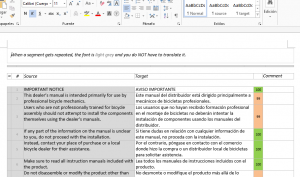 It is also useful as a format to send to the reviewer because they can add comments or observations in the column on the left hand side. If this were not already enough Editor is free and works in satellite mode, so that one uses the web’s resources and does not depends on the Internet connection. Mind you, the translation memory, the terminology and check-ups are carried out through the Internet. External translators do not have to buy anything if the translation agency has the sufficient licenses. It is matter of asking the translators whether they agree with using a new format of translation interface. Personally, I remember that some translators were opposed to use the first SDL interface, the itd. They only had Trados, or worse, they only wanted Trados. And a few years earlier they were reluctant to use the Trados discounts. The gain consists in, of course, a translator that uses it for their own work or when used internally by a translation company. I’ve translated web pages at a rate of approximately 1000 words in just over 1 hour. I think Memsource is a very attractive alternative method that both freelance translators and translation companies should consider. The use is simple for anyone who has used the typical two-column display. As it is based on xml, tends to have few tags when converting files xml, docx, etc., and these are easy to place (F8). Memsource copies and pastes them in order and to do so only click on where you want to place the label. With customized automatic translation we can get much in the terminology right, but the syntactic construction of the sentence can be confusing.